ZF exactly customized the new 8 TX to these specific requirements in high pressure pumping applications. It offers eight gears and particularly harmonious gear transitions as well as a high spread of gear ratios. Together with the very robust basic design, this minimizes both component stress and wear and results in a reliable, durable transmission with very low life cycle costs. More than anything else, it ensures a precise control of the pumping station. The latter can be highly powerful with the new ZF powershift transmission because the 8 TX has been prepared for a power of 1,912 kW / 2,600 hp. What makes it literally unique, however, is its special design: Thanks to state-of-the-art BUS communication and modular programming possibilities, the ZF transmission operates without a torque converter. Trouble-free continuous operation is ensured by a flexible coupling with the latest damping technology which prevents the transfer of engine vibrations. Furthermore, the 8 TX dissipates less heat thanks to its sophisticated design. ZF integrated the complete control electronics directly into the transmission. 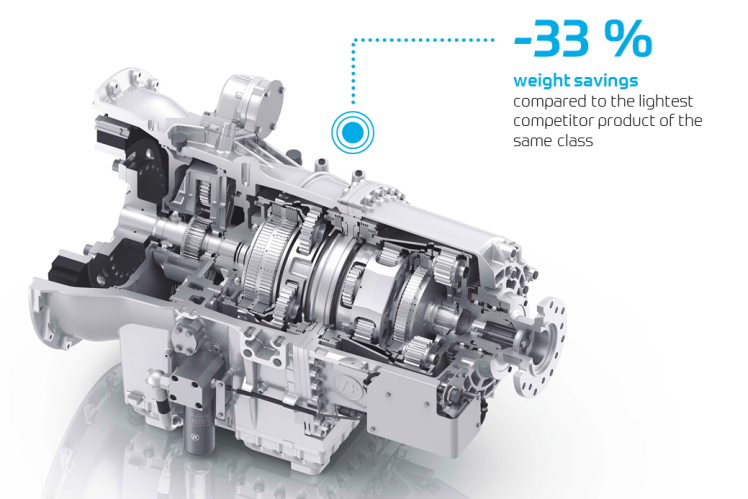 Additional optimizations such as a clutch housing of aluminum make the ZF transmission the lightest transmission currently available in its class: It weighs only 1,273 kg / 2,806 lbs in a dry condition, including the clutch. Furthermore, it is of a very compact dimension with a length of 149 cm / 55.66 in and a height of 85 cm / 33.46 in. Regardless of that, the 8 TX offers a high level of flexibility: Two PTOs are also available. Also assembly is simplified with the ZF transmission because, thanks to its three-point linkage, it can be easily and precisely moved to the requested position. The ZF 8 TX is a particularly efficient product that has been specially designed for use in oil and gas production. It surpasses its competitors in terms of power-to-weight ratio which leads to the highest flexibility for trailer manufacturers during vehicle assembly and compliance with country-specific requirements. Since it is electronically controlled via CAN bus, convenient operating features can be implemented.